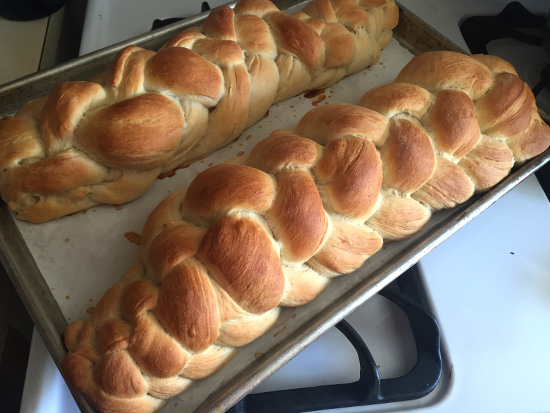 I just made the best vegan challah of all time, and I used a very simple but very special ingredient... aquafaba. 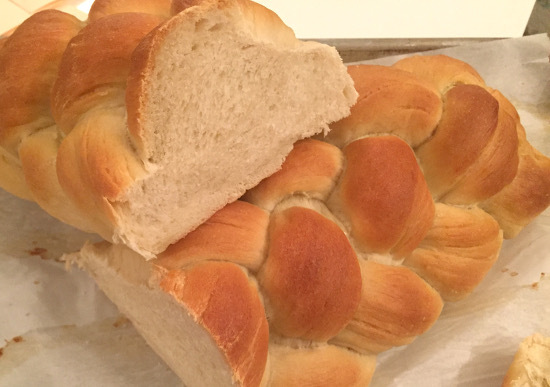 Yes, bean water makes the lightest, fluffiest, more tender and delicious bread you can imagine. 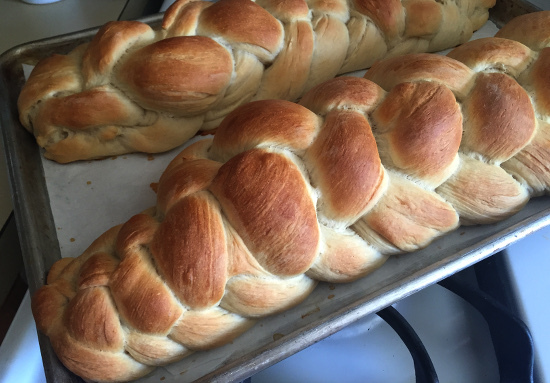 You can tear off little chunks, follow the curves of the braid and pull apart like a pretzel, or even slice for sandwiches and French toast. 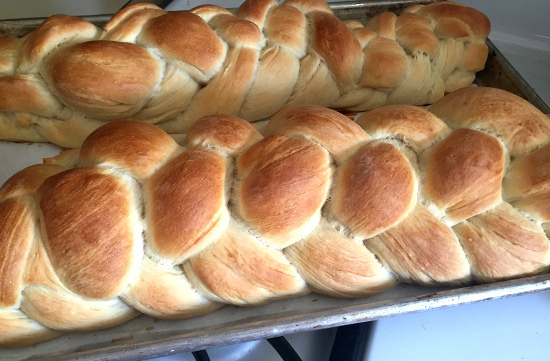 When I was little, I had a special "aunt" who was really one of my mom's best friends who I would visit every Friday and with whom I often baked challah. 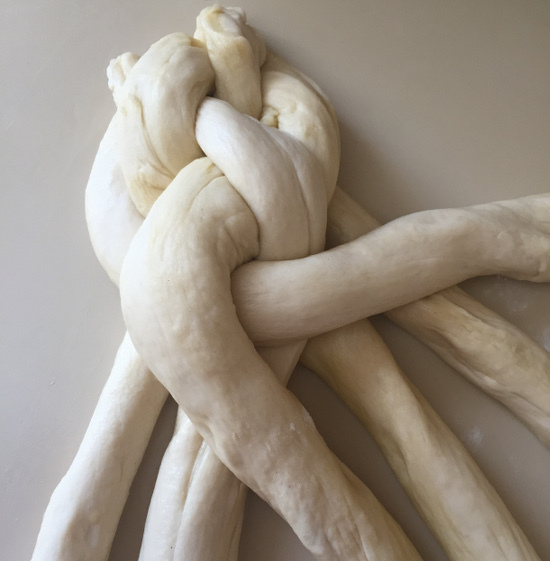 I remember standing on the stool in her kitchen mixing and braiding this special dough. I think we always made two loaves because I know I brought one home each time. Now that I have kids, I have made two revelations: 1. Aunt Jo Ann seemed like such an adult, but she must have been the age I am now. That's weird. Am I old? And 2. Those Friday mornings weren't about me at all; they were about my mom. She finally got a break. Of course, she still had my sister at home to take care of, but it gave her time to focus on one kid instead of trying to balance two. A third revelation... was there ever a time my sister went somewhere special and I spent time with just my mom? I don't remember that time, if it existed. 1. Take 1 tablespoon of your ½ cup of sugar and add it to the warm water. Add in the yeast and stir just until it’s all wet. Set aside in a warm spot until the yeast has dissolved and the top looks foamy. 2. Meanwhile, add the rest of the sugar, 3½ cups of the flour, and the salt to your mixing bowl. 3. 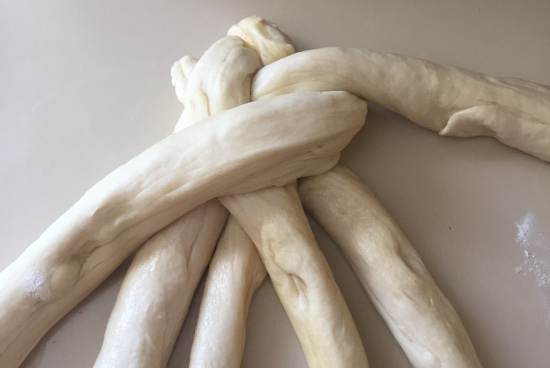 When the yeast is foamy, add it to the mixing bowl and mix well with a bread hook. When it’s all combined and smooth, add in the aquafaba and oil, continuing to mix until it’s mixed in. 4. Slowly add in the rest of the flour, using just as much as you need to have the dough pull away from the sides of the bowl. I usually need almost all of the flour. 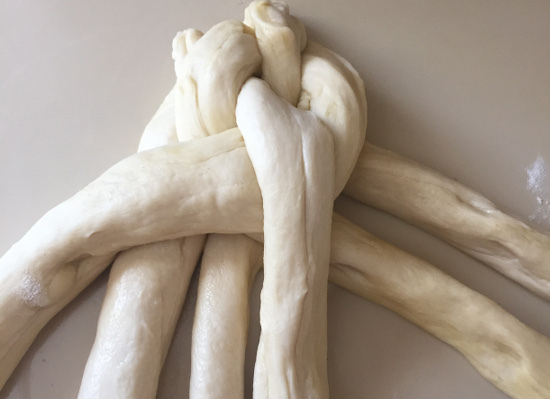 The dough will be thick and springy. 5. 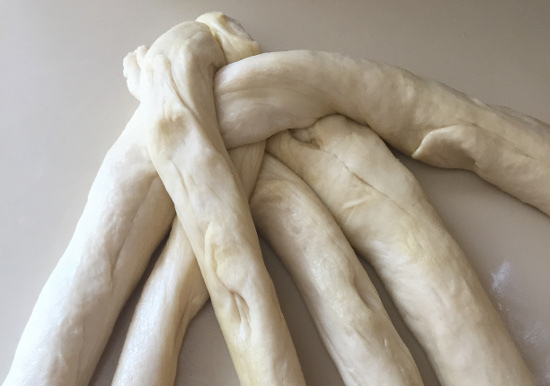 Upend the dough onto a clean, lightly floured surface and knead for 10 minutes, until the dough is springy and smooth. 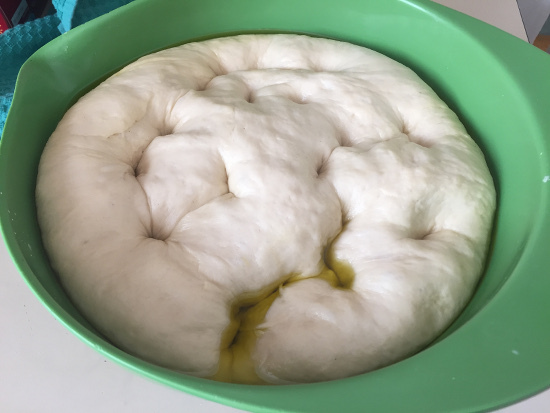 If you push down lightly on the dough, it should bounce right back to the original position. You could use the dough hook to knead here, but I feel like it’s more a better knead if I do it by hand. 6. Place the dough in a lightly oiled bowl and turn it over once to make sure it’s covered in oil. Cover it with a clean towel and place it in a warm spot to rise. It will rise for a total of 2 hours, and every 20 minutes you want to punch it down in about 4 spots and then let it rise again. Note: You can definitely make this dough without a stand mixer, just mix with a spoon and knead by hand. 7. After two hours of rising, put the dough on your clean counter and split it in half. We’re making two loaves, so let one sit for a few minutes until you’re ready for it. I absolutely love the look of a traditional six-strand braid, and it's actually very simple once you get the hang of it. 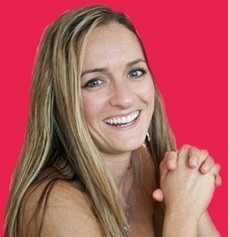 You can always opt for a simple three-strand braid at this point, or really, make any shape you want. 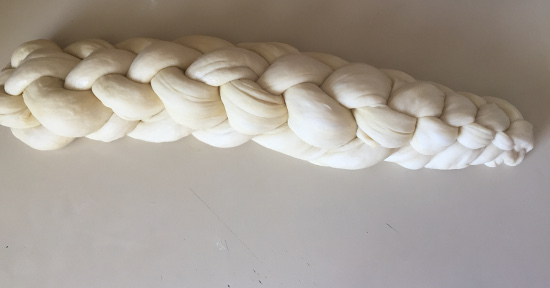 Here's my guide to the 6-strand. Step 1: Split your first dough in half and then cut each half into equal thirds. 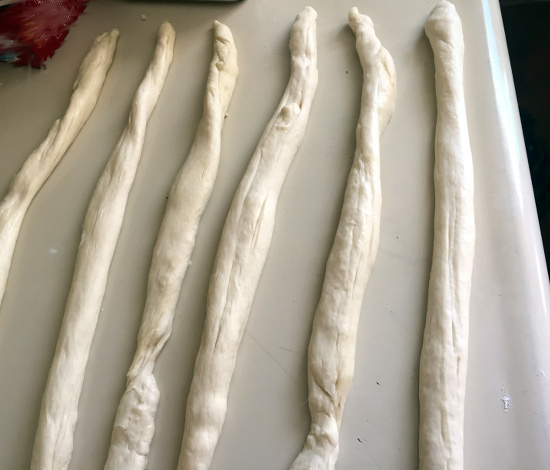 Roll each chunk into a snake about 12 inches long and roll the edges until they’re slightly tapered. Step 2: Connect the top tips of the six strands and press them together. Step 3: Pull the second from the left strand so it goes all the way to the right side, outside of the current right piece. Step 4: Pull the left strand into the middle of the strands, so there are two on the left of it and three to the right of it. Step 5: Pull the second from the right strand all the way to the left, outside of the current strands. Step 6: Pull the far right strand into the middle so there are two strands to the right of it and three strands to the left of it. Step 7: Pull the second from the left strand so it goes all the way to the right side, outside of the current right piece. Step 8: Pull the left strand into the middle of the strands, so there are two on the left of it and three to the right of it. Step 9: Pull the second from the right strand all the way to the left, outside of the current strands. Then pull the far right strand into the middle so there are two strands to the right of it and three strands to the left of it. Continue this process until you're at the end of the loaf. 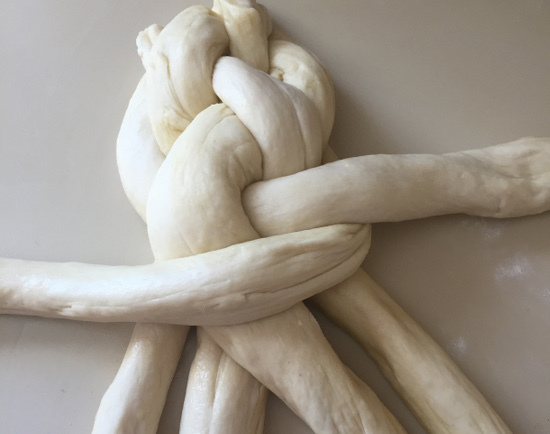 Turn the ends of the braid under the loaf. 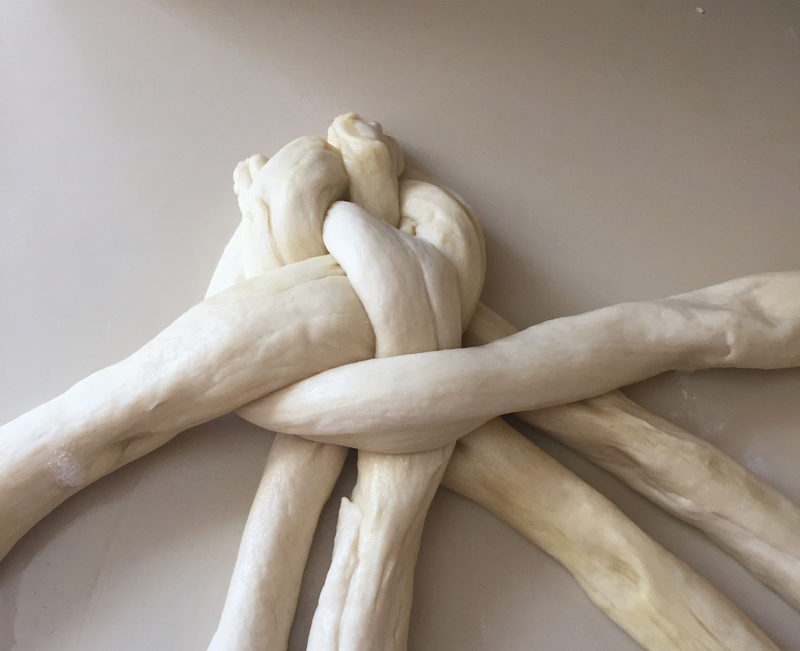 Now, braid the second loaf. 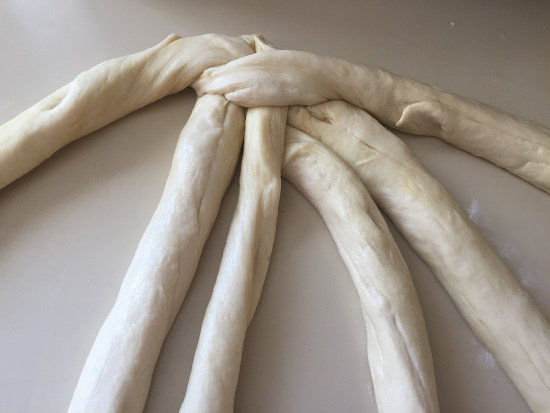 Once you have both loaves braided, move them to a cookie sheet covered in parchment paper and leave several inches in between each loaf. Set the loaves aside to rise for another hour. 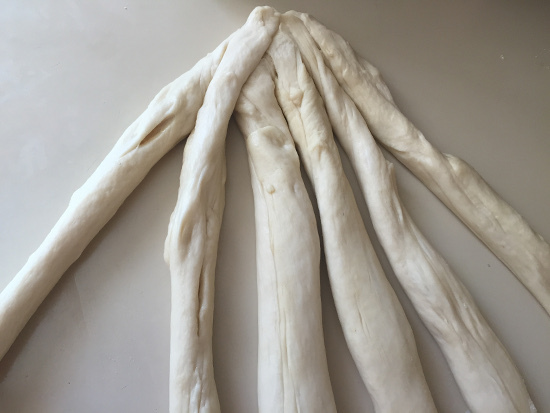 Brush the top of the loaves with aquafaba. 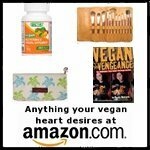 You can sprinkle on poppy or sesame seeds here if you like. Preheat the oven to 375 degrees F. Bake for 25 minutes, rotating halfway through, until the top is golden brown and the bread sounds hollow when you knock on the side. 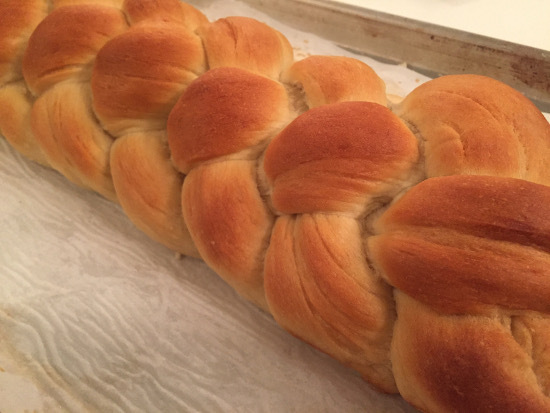 Turn off the oven and leave the challah in for another 10 minutes. 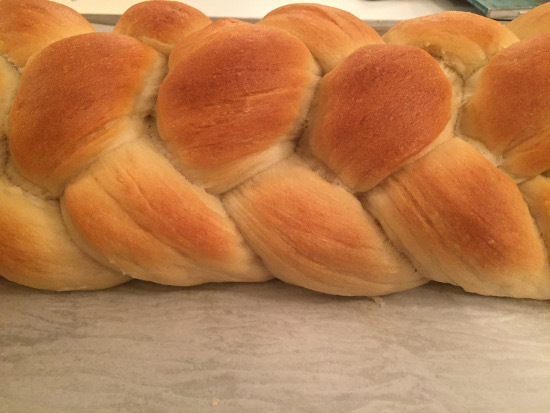 Now it's time to slice and enjoy this vegan challah. Check out the crumb on these puppies.